GIRDS: Right-Wing Terrorism in the 21st Century. Right-Wing Terrorism in the 21st Century. In October 2016 the currently most extensive study on right-wing terrorism in Germany was published by Routledge, which is largely based on the the DTG dataset and includes a full list of the analyzed groups and actors. The book “Right-Wing Terrorism in the 21st Century. The National Socialist Underground and the History of Terror from the Far-Right in Germany” can be ordered here or by clicking on the cover below. One would have thought that German academics after 1945 would make right-wing political violence a major object of study – if only for the reason of history not repeating itself. However, avoidance of, rather than focus on, terrorism from the far right has been the reality. Now, 70 years after the defeat of National-Socialism, there is finally a longitudinal empirical analysis of political violence from the right. Based on a comprehensive database and a solid conceptual framework, Daniel Koehler has tested – and found wanting – the two most widely used theories on the phenomenon and thereby cleared the ground for a new understanding of what unfortunately is likely to be a rising phenomenon. A remarkable achievement – and long overdue. Daniel Koehler has written an important and timely book on a critical dimension of terrorism studies that lamentably has received insufficient attention: extreme right-wing violence in Europe. His focus on Germany sheds light on the motives, networks, aspirations and the threat posed by this small, but ambitiously lethal and stubbornly persistent entity. This excellent work is noteworthy for to the thoroughness of the author’s research, the compelling analysis he presents and unsettling conclusions he reaches. 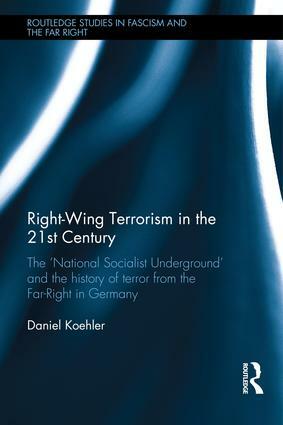 Daniel Koehler’s new book is the most comprehensive study available on right-wing terrorism in Germany and also an important contribution to research on right-wing terrorism in general. His conceptual clarity and comprehensive collection of data makes for an admirable work of scholarship. Daniel Köhler has written the most comprehensive account to date of right-wing terrorism in post-WWII Germany. The German case is critically important, not only because of its historical legacies, but also because Germany remains Western Europe’s definitive hotbed when it comes to contemporary right-wing militancy and violence. Köhler effectively sheds light on key actors and events from the past, while at the same time demonstrating that right-wing terrorism has become a continuous yet conceptually and legally elusive type of threat in Germany and beyond – a threat that will require more attention in the future.